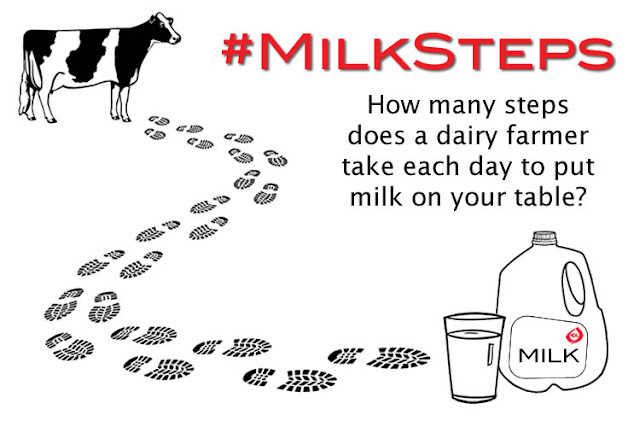 Q: How many steps does a dairy farmer take each day to put milk on your table? A: Lots! That's the short answer. Keep reading for the long answer. 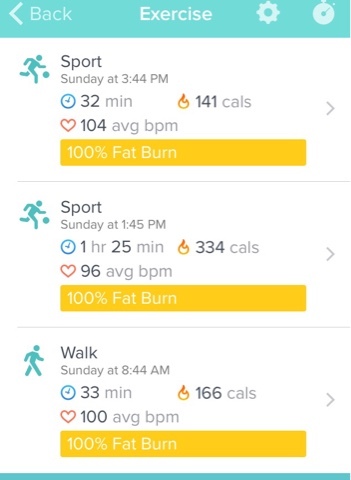 In honor of June Dairy Month, some of my dairy farmer friends and I used Fitbits and smartphones (and other devices) to track the steps we take each day while farming. 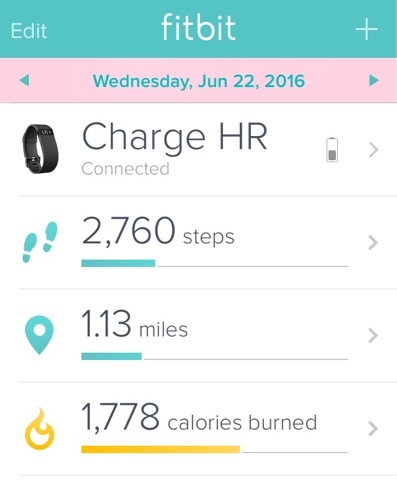 I found that I take about 20,000 steps each day. Glen tracked his steps for a couple days this month, too; he takes about 35,000 steps each day. I didn't keep track of how many steps Dan, Monika, and Daphne take each day, but some of their steps certainly contribute to finishing all of our chores. Q: Where do all those steps come from? 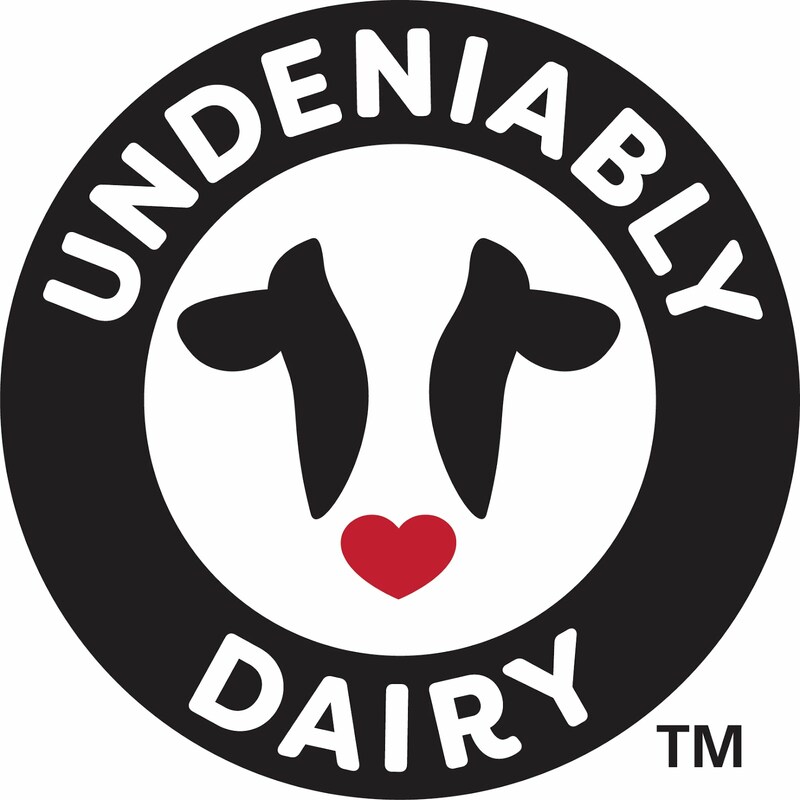 A: There are lots of jobs that need to be done each day on a dairy farm to make sure that our cows and calves are well cared for – everything from milking the cows and feeding the calves to harvesting the crops that provide feed for the cows. 5:37 a.m. Fetch the cows from pasture. 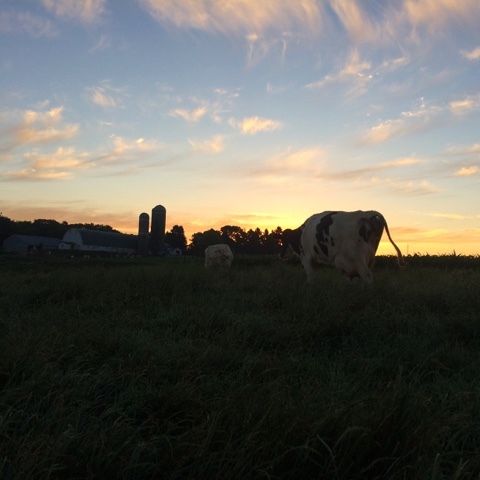 During the summer, our cows spend their days and nights out in the pasture. Some of them have internal alarm clocks that tell them to come to the barn when it's time for milking. Those without alarm clocks need to be brought in. 6:17 a.m. Milk the cows. It takes us 2½ hours, morning and night, to milk all of the cows. This morning we're milking 62 cows. It takes about 10 minutes to milk each cow, from the time we start cleaning her udder to when we detach the milking machine and apply a post-milking conditioning dip. 8:48 a.m. Still milking cows. We're sampling each cow's milk this morning, so milking is taking a little longer. 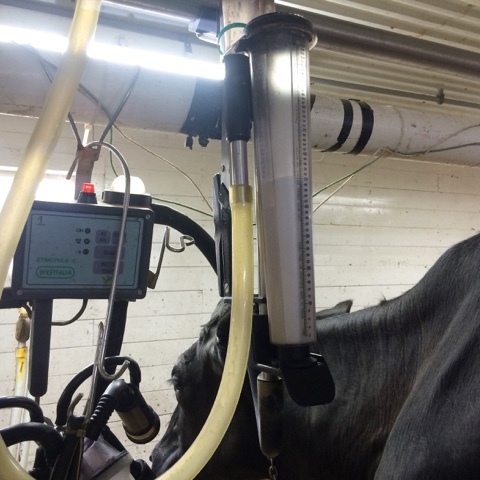 A meter is attached to each milking machine to measure how many pounds of milk each cow gives. A small sample of milk is taken from each meter to be tested in a laboratory for quality. 9:23 a.m. Feed the calves. I carry bottles of milk out to the calves in hutches while Glen puts fresh wood shavings down in the group calf pens. 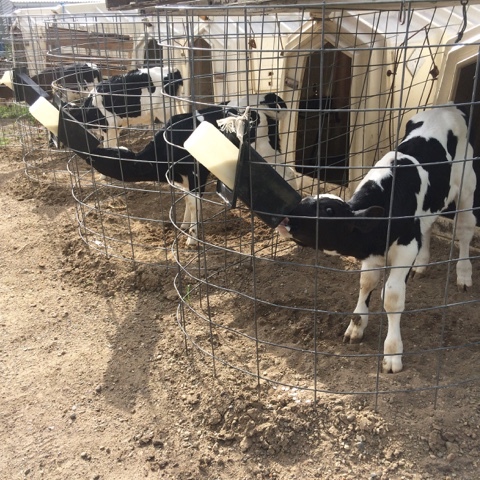 Most of our calves live in a big group pen with an automatic calf feeder, but we start them out in small group pens and individual hutches for a couple weeks before they move to the big group pen. Dan and Monika are cleaning the walkway and stalls in the barn and putting fresh shavings down. Glen makes sure the washing system is cleaning all of the milking equipment. I clean the automatic calf feeder and tidy up the milk house. Clean up gets done twice a day, every day. But today we have special guests coming to visit our farm and learn more about dairy farming, so we put down extra shavings and do a little extra sprucing up. We also left a couple cows in the barn for our guests to meet, since the rest of the herd has gone back out to pasture. 10:51 a.m. Share our farm. Helping others learn more about dairy farming isn't something we "must" do, but sharing our farm is something I greatly enjoy. I believe strongly that the best way to learn about farming is to visit a farm and experience it in person. Today, my friend Becky, who visited our farm two years ago, brought her daughter-in-law and grandchildren out for a visit. We showed them the cows, calves, kittens, and chickens. The kids got to pretend to drive the skid loader and tractor. Becky brought a lovely picnic lunch. Then my kids and Becky's grandkids ran around some more. I'm pretty sure Becky and Amanda had a quiet drive back to the Twin Cities. 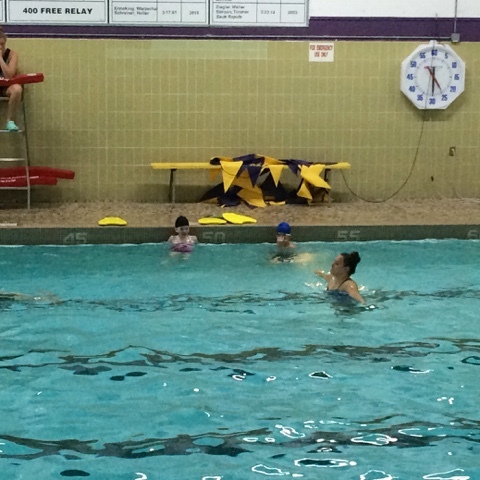 Dan and Monika have swimming lessons every day this week. Their session starts at 2 p.m., so we raced to town. 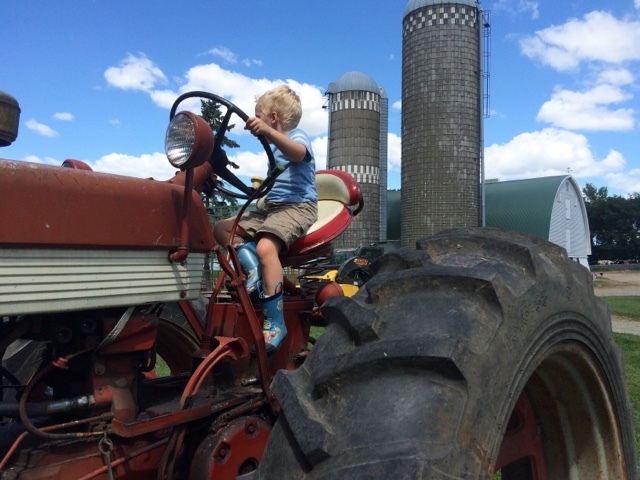 I try to balance letting my kids be farm kids for most of the summer, but also be involved in local youth programs. Dan is playing softball this summer and Monika is in a gymnastics class. We started baling and wrapping hay yesterday, but had an equipment breakdown. So we're trying to finish up today. The hay is baled slightly wet and wrapped so that it ferments. This allows us to preserve feed quality without drying the hay. 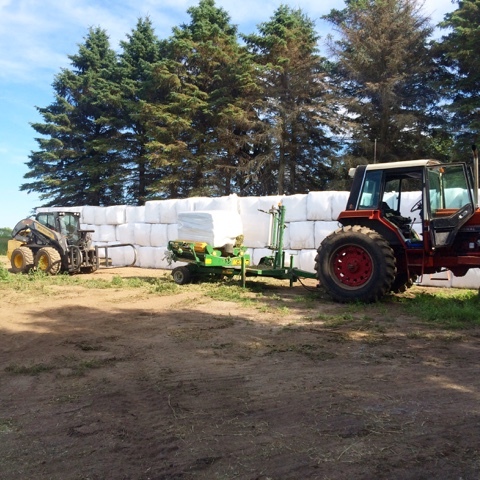 Depending on the nutrient values that come back from the lab when we test the hay, these bales will be fed to either our milking cows or growing heifers. Glen and a whole crew of family, friends, and neighbors are baling the hay and hauling the bales from the field to our yard where they're being wrapped and stacked. 5:24 p.m. Check for monarchs. 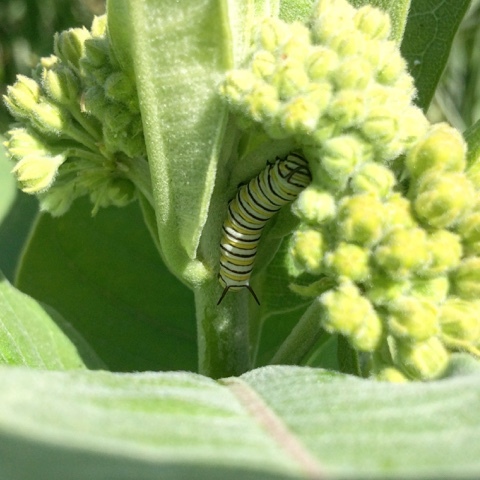 Our relief milker is milking the cows for us tonight, so I have some time to sneak out to a milkweed patch to check for monarch eggs and caterpillars. I found the first eggs last week and first caterpillars this week. This one is the biggest caterpillar I've seen yet this year, which makes me giddy with excitement. At this time on a "normal" day – i.e. when we're not making hay and/or don't have our relief milker – Glen would be finishing up mixing feed for the cows and I would be fetching the cows from pasture for evening milking. 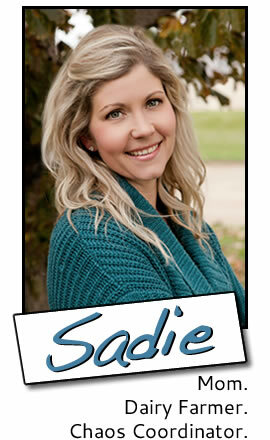 But today, Glen is still hauling bales and I'm using this time to catch up with emails and work on my blog. 7:40 p.m. Leftovers for supper. Becky kindly left the extras from our picnic lunch, so the kids and I are noshing on leftovers for supper. Woo hoo! I love to cook, but leftovers make my life a lot easier. I go back outside to feed the bottle calves their milk and put grain down for the rest of the calves. Glen just finished hauling bales and took off to go get the tractor and mower from the implement dealer where the mower was getting fixed. 10:52 p.m. Mix feed for the cows. In addition to their summer pasture, we feed our cows a mixture of corn silage, fermented hay, and a vitamin/mineral/protein mix to balance out their diet. Together with comfortable housing, good nutrition is the foundation for content, healthy cows and high quality milk. The cows are having a late supper tonight. 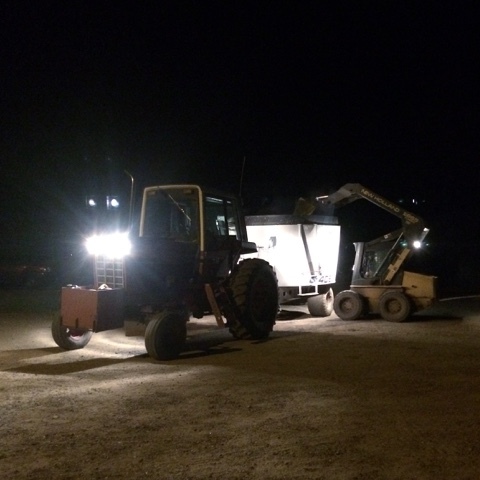 Since it's so late, I help Glen load the ingredients into the mixer and then unload the feed into the feed bunks. The cows know when it's feeding time, so they come back in from pasture for their late night meal. 11:57 p.m. Hit the sack. We're calling it a day. The cows are milked and fed. The calves are clean and their bellies are full. We wrapped a boatload of bales, but still have more to wrap tomorrow. 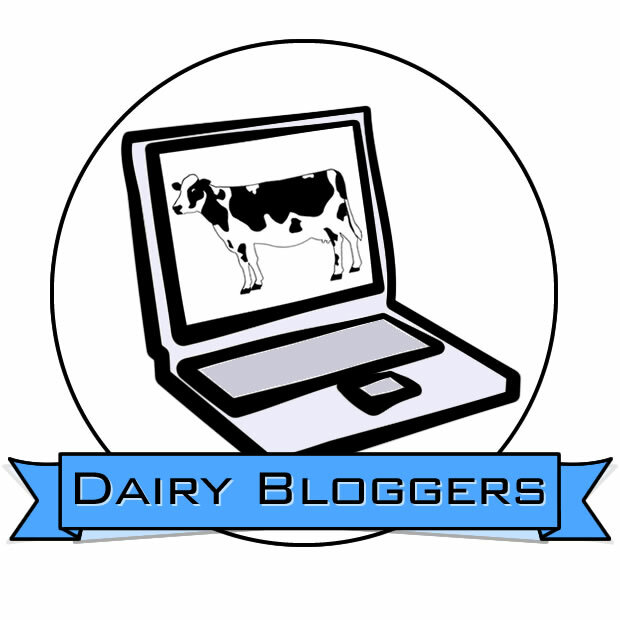 After keeping track of my steps for a month, one thing is certain: No two days of dairy farming are the same. There are outside jobs that "must" be done each day: milking, feeding, and cleaning. My day also requires some non-farming jobs, like preparing meals and chauffeuring kids. 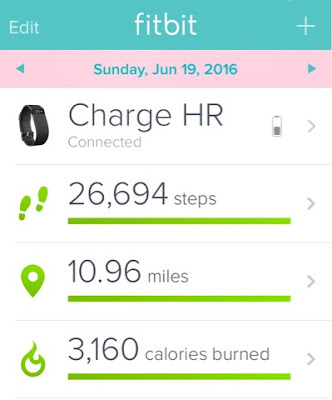 For me, those days require about 20,000 steps. But there are days when I spend more time in the car, in the bleachers, or in front of the computer and, obviously, take fewer steps. I even had a couple sick days this month – one of which literally left me in bed for most of the day. And then there are days when I work outside all day. Usually those are the days I clean calf pens (which, interestingly, Fitbit thinks is a sport) or move calves. Those are the days we eat cold sandwiches for supper because there's no down time for meal prep. Glen works outside all day, every day. That's why he takes almost twice as many steps as I do. But even working outside all day results in vastly different step counts. Spending a couple hours in the skid loader unloading hay tallies up far fewer steps than a couple hours checking fences or spraying thistles. Cleaning calf pens and washing walls. If I crunch the numbers a little, figuring that our kids contribute 5,000 steps between them, it takes about 60,000 human steps each day to care for our cows and calves.